Do you sometimes stop to listen to your thoughts and wonder where they are coming from? 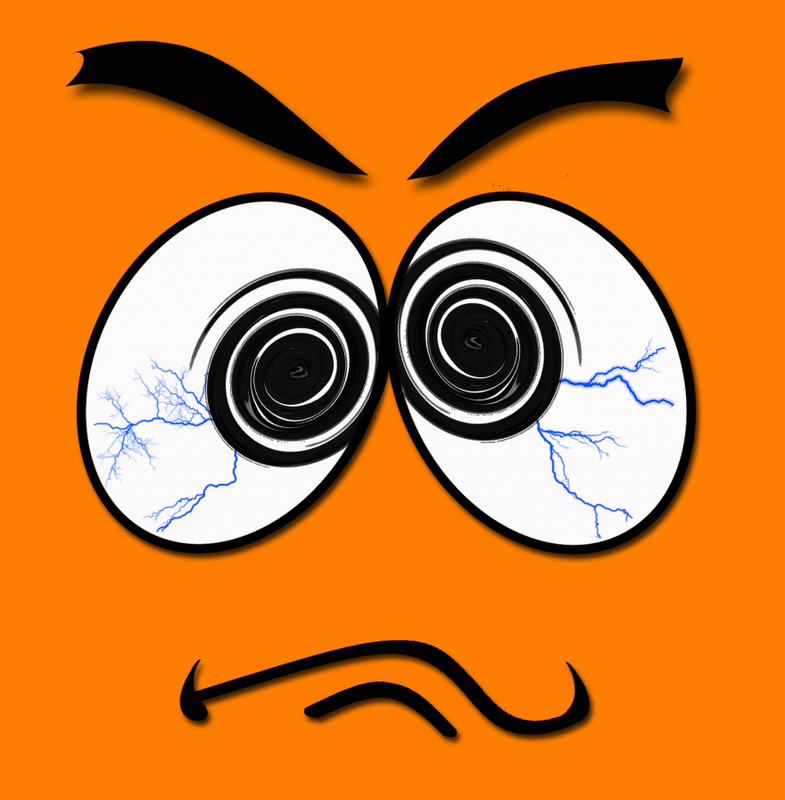 Sometime, when a really smart thought, a particularly creative idea, or a funny pun comes up, you might say something like “Wow, where is this coming from?”, in astonishment. On the other hand, when your thoughts sound like “I'm not good enough,” “nobody loves me,” “everybody else is more successful than me,” you don’t question for a minute where it’s coming from – you know that it’s coming from within you and that it is the truth. But is it really "the truth"? Truth is, most people’s mind chatter is negative self-talk most of the time – and it can be pretty devastating. I have good news for you. 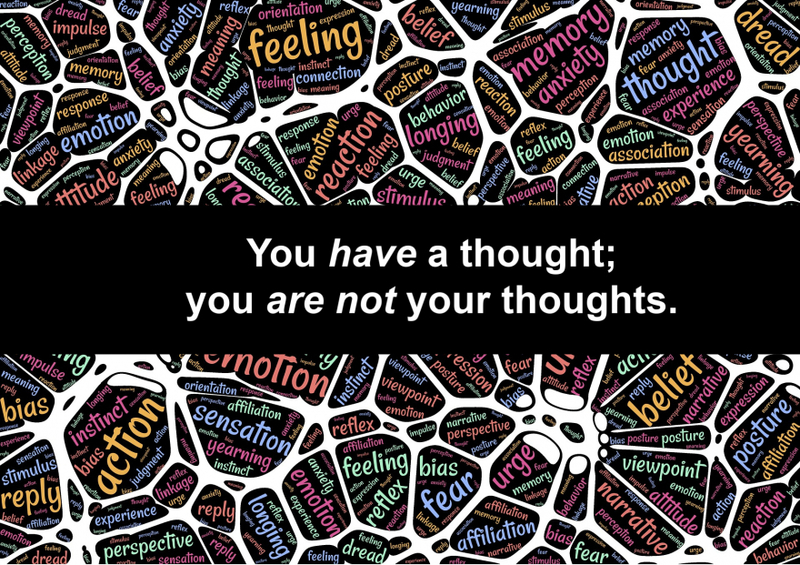 It might be hard to believe, but you have thoughts; you are not your thoughts. This means that you don't have to believe everything you are thinking. In fact, you don’t even have to believe anything you’re thinking, it can as well be gibberish inherited from a long time ago. As incredible as it might sound, for the most part your thoughts don’t define WHO you are. Back then, your parents or caregiver might have taught you to be afraid of crossing the street, talking to strangers, touching a cold oven plaque. And now you think life is a dangerous place (and you have plenty of proofs for that!). Likewise, you picked all kind of thoughts and strategies to help you survive along the way – how to avoid mom’s dark look or dad’s anger; how to shut up to keep peace in the family. It was easier and simpler to think that you were not good enough as a reason for your parent’s fights, or that you were not lovable enough as a result of being bullied in the schoolyard. It all made sense when you were 4, 8, or 12 years old. Does it still make sense today? Of course it doesn’t. But you might not be ready to believe me right now. See, when I say that the real me is my plain, exhausted self and not my vibrant self, it actually puts me down. It sounds like a victimless crime, but it’s not. Because at the end of the day, it’s the sum of our put-downs or the sums of our thumb-ups that will determine whether we have a feeling of serenity and happiness, or whether we have a feeling of frustration and helplessness. It is the sum of our dominating thoughts that is going to create our reality. And once we dissociate from our habitual thinking, then we can choose our thoughts according to the life we want to have. Understanding that you have thoughts and that you are not your thoughts is fundamental to shift into a Success Mindset so you can live life on your own terms. So, pay close attention to your mind chatter this week, be more skeptical about believing it, and ask yourself a few questions: “where is this thought coming from?”, “who is talking – is it my mom, my sister, my childhood priest, society?” And most importantly, “is it still serving me, today?” By being the observer, you will start to see some pattern arising. How you can change those pattern? Experience coaching with me live in a group coaching format every Thursday evening @ EFT/Tapping for an Unshakable Success Mindset. 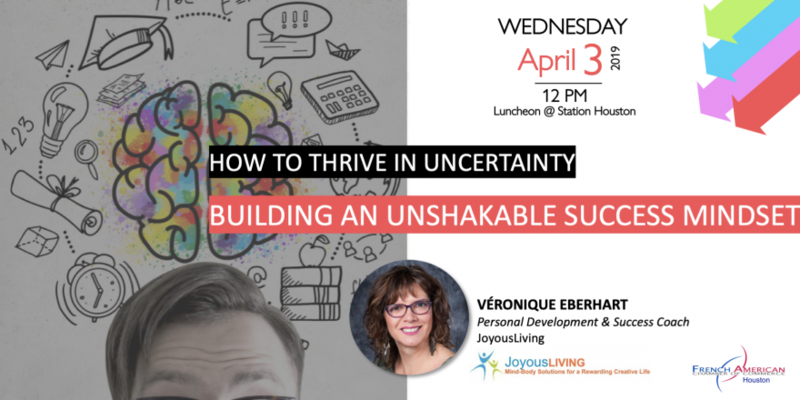 During each session, we examine a different aspect of Building an Unshakable Success Mindset, so you can live life on your own terms. 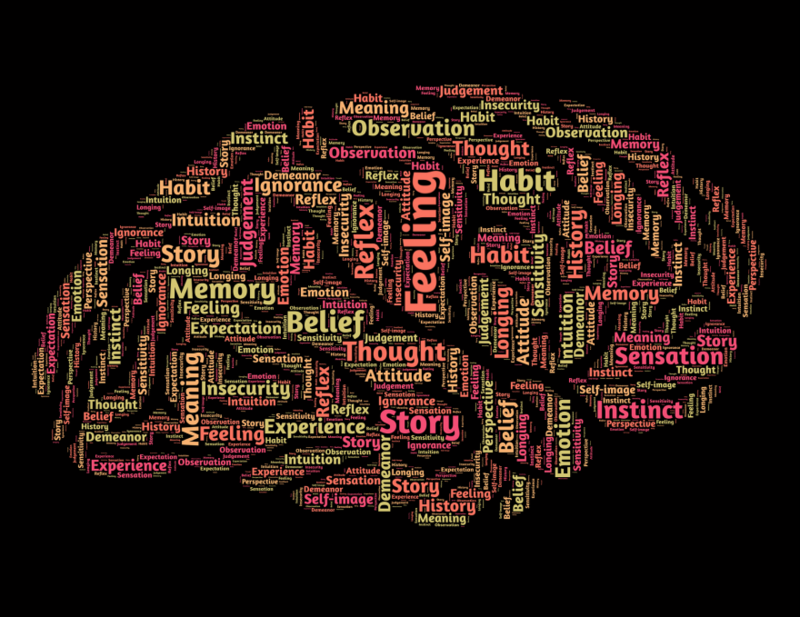 This week, we will explore the Mind Chatter (some people call it the "Monkey Mind"), and Mental Models. Then, we'll tap our way into an empowered Success Mindset. 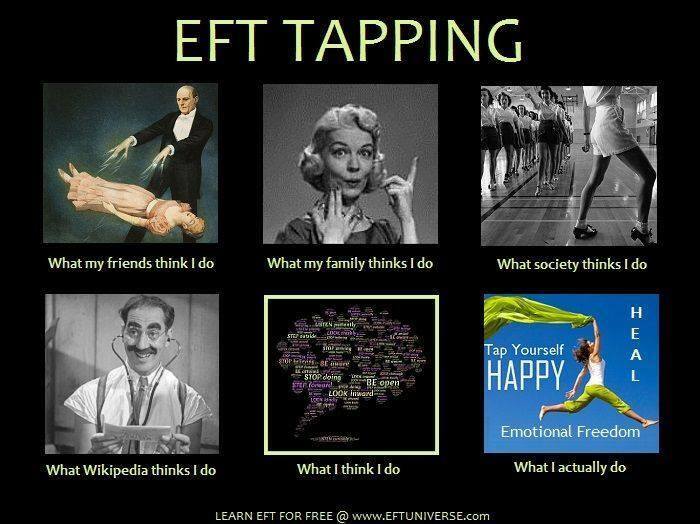 Each 1st Thursday of the month is FREE monthly intro to EFT/Tapping . I will answer your questions about Emotional Freedom Techniques (what it is, how it works, and how to use it in the context of building an Unshakable Success Mindset). I will also take questions about what is currently on your mind and that you would like to change, and we will tap our heart out! Through my website EFT/Tapping for an Unshakable Success Mindset. Through Meetup EFT/Tapping for an Unshakable Success Mindset. 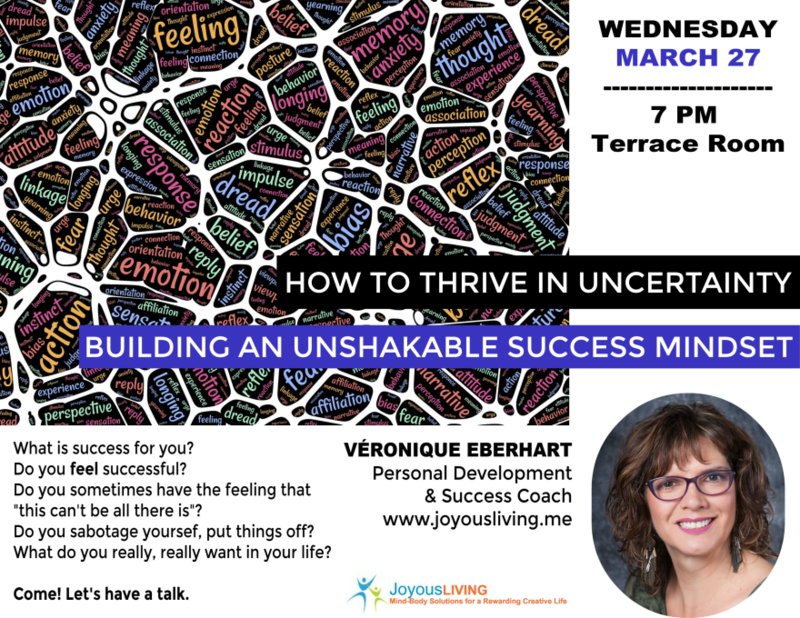 I'm starting a series of talks on "How to Thrive in Uncertainty, Building an Unshakable Success Mindset". Email me at ve@Joyousliving.me to book a talk. Are you ready to free yourself from old paradigms? Are you ready to finally live your life on your own terms? Then chat with me to see if we are a good coaching match. Schedule Your free One Hour Clarity Session with me here.